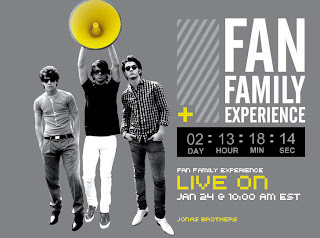 LINES, VINES, AND JONAS TIMES: First FanFamilyExperience Deadline! Earn the top impact score in your state and you will get a signed Jonas Brothers 3D movie poster! Even though you may not have the highest Impact Score overall (yet!) you can still earn great prizes! You have until March 1st! Honestly, I'm not even going to bother. Cause i only have like 50 points, but i've given up so long ago. Honestly, i will not sit in front of the computer all day adding people for more points. That's not even helping the Jonas Brothers! People should get points for creating fansites, blogs, youtubes, myspaces, fanclubs, etc. for the Jonas Brothers. Not by simply pressing the add button continuously throughout the whole day. But that's just me. I hope YOU win.